White Paper Published By: TIBCO Software Inc. The unproductive planning session: we've all participated in them and left with a sense of frustration that questions remain unanswered and issues unresolved. Not to mention that the typical communication tools - static PowerPoint presentations and reports - do not engage participants, nor can they respond to questions that arise during the meeting. Instead of leaving with an action plan, "I'll have to get back to you on that" is often the take-away, along with a lack of consensus. Recently, progressive companies have begun to conduct their business reviews, strategy meetings and planning sessions in a much more productive way - using dynamic data visualizations to facilitate collaboration among participants and yield actionable results signed off by all stakeholders. 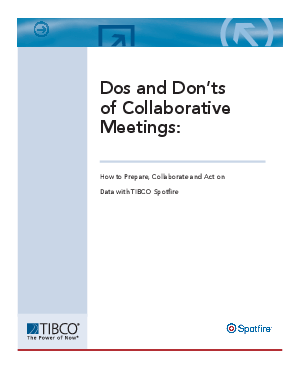 Download this free white paper from TIBCO Spotfire, and see how they are doing it.